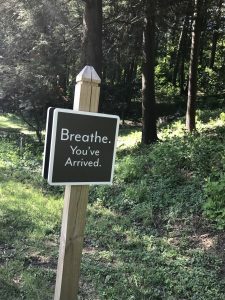 Wherever you were going, you’ve arrived here; so take a moment to stop, and breathe. Stopping and focusing on your breath can bring an immediate sense of serenity to your body, mind and spirit, quite possibly changing the course of your day for the better! Chances are that not everything that’s happened today, leading up to where you are right now, has gone as planned. There may have been some unforeseen events that may have caused some stress. Not everything in life goes off without a hitch! If that’s the kind of day you’ve had so far, you may be clenching your jaw, you may be tensing the muscles in your neck, jaw, stomach, and shoulders; and your breathing may be shallow. You have the power to turn it around and bring calmness into your body! Take a moment, close your eyes and take a few luscious, full belly breaths. It may have been such a long time since you’ve really enjoyed taking a breather, you may not even remember how to do it! If you watch a newborn baby, they have their breathing down perfectly, their belly rises and falls, fully filling with nourishing air, taking what it needs before slowly exhaling, not even thinking about it! Somewhere along the way, we may have “unlearned” this simple act. If you fall into this group, here’s how to take a delicious cleansing breath: first, fill your belly slowly with air, let it then fill your ribs, then your chest. Slowly exhale in reverse, from chest to ribs to belly. It may be helpful to repeat the order in your head, as you inhale, “belly, ribs, chest “; as you exhale, “chest, ribs, belly”. Picture slowly filling a balloon with air, then slowly deflating it. It only takes a few cleansing breaths to have immediate calming effects! By shifting your energy in this way, your calmness will have a domino effect on those around you, bringing calmness to them as well. You may still have some unplanned things happen, but you’ll have given yourself the tools to handle obstacles without them causing you physical, mental or emotional stress. When you and those around you are feeling serene and relaxed, the whole office will be a more pleasant place to be, ultimately resulting in a healthier and more productive environment for all! 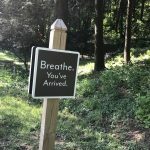 *Photo was taken on the grounds of Kripalu Center for Yoga & Health in Stockbridge, MA, one of my favorite places on earth! We all want to feel our best! We want to have the energy to do a good job at work, at home, and be there for those that may be depending on us. It’s surprising how certain habits may have a positive or negative ripple effect on how we’re able to reach that goal. We all have busy daily routines and feel that we’re doing all we can to get out the door and get to work on time. In doing so, we may not always be doing what’s best for our health; both short and long term. These habits will ultimately will catch up with us and have an effect on the quality of our work. Many of us skip breakfast with the intention of having a bite to eat at our desk once we get to work, or we will grab a quick bagel, muffin or donut and coffee at the local drive through coffee shop. A few small changes can result in big changes in health and wellness! When we fuel our bodies with a healthy breakfast, it’ll keep us feeling energized, keep our bodies strong, and help in assuring that we’re able to give 100% each and every day! Coffee and a bagel or pastry may taste delicious, but is not the most nutritious way to nourish our body! The combination of caffeine and sugar may make us feel alert in the short term, but our energy will surely crash by mid-morning, leaving us craving another cup of coffee and sugary snack. For sustained energy, it’s best to start the day with some protein, healthy fat and complex carbohydrates. Prep a smoothie before bed and have it ready to blend in the morning. Make it a combination of liquid (milk or non-dairy milk such as unsweetened almond milk), some fruit such as frozen berries or banana, healthy fats such as avocado, a spoonful of coconut oil, peanut butter, or almond butter and a scoop of unsweetened protein powder to assure that you get your combination of protein, complex carbohydrate and healthy fats. Some tasty combinations to add to the liquid are peanut butter & banana; unsweetened cocoa, a pitted date, frozen cherries, a slice of avocado & pure almond extract; frozen blueberries, a date & a slice of avocado; chocolate, almond butter, avocado & mint; frozen pineapple chunks, coconut milk, vanilla extract, frozen banana or mango makes a tasty tropical treat! A hand blender works great for mixing a smoothie up quickly and is fast and easy to clean. Stock up on frozen fruit, or freeze your own by lining a rimmed baking sheet with parchment paper and putting washed and dried berries, chunks of mango, pineapple, melon or mango or peeled banana. Once it’s frozen, place in a labeled, dated freezer bag and you’ll always have a nice base from which to make a creative smoothie with. Use unsweetened fruit and avoid adding additional sweeteners. The fruit is sweet enough! It may take some initial planning to establish new habits, but once they’re established they become part of our normal routine. It’s surprising how energetic we feel by filling our body with nutritious food, we may even gain an extra few minutes each morning! 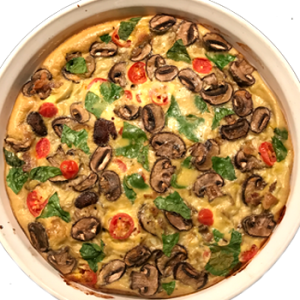 A delicious and nourishing baked frittata (omelet) which can be baked and enjoyed all week! Fluffy baked eggs mixed with your choice of fillings. 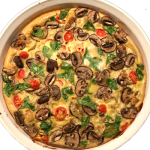 I used mushrooms, grape tomatoes and spinach in the one pictured. Get creative and fill it with your favorite vegetables and fresh herbs and make your own uniquely delicious combination! Preheat oven to 400 Degrees F. Generously grease a 10” round shallow casserole dish with cooking spray or olive oil. Arrange chopped/sliced vegetables (and shredded cheese if using) in the bottom of the dish. Set aside. In a medium bowl, mix slightly beaten eggs with milk until thoroughly combined. Pour over vegetables in dish. Season with sea salt and pepper. Bake for 25 minutes or until firm. Makes 6 servings. Allow to cool and slice into 6 servings. This makes a delicious breakfast for the week. Simply store slices in a container and take a slice out each day. If layering, put parchment paper in between each layer. It’ll be easy and quick to take out a slice to heat and eat each morning! *Note as an alternative, instead us using a shallow casserole dish, bake in a silicone muffin pan to make individual frittatas, checking after it’s been baking for 20 minutes and baking until firm. What type of position are you looking for? Please select all that apply. Please take some time to complete the boxes below. The information you provide will help us in assessing what opportunities are the best match for your background and skill set. Please be as detailed as possible. What are 3 of your most significant accomplishments? All inquiries and shared information are treated in strict confidence. Thank you for trusting us to assist with your next step in your career.